Green Beans are young, immature beans that are eaten fresh (as opposed to dried) in their green pods. When buying fresh green beans, pick bright coloured, firm ones, and leave the faded, limp ones behind. Runner Beans, which are popular in Britain, are like green beans, but they are much longer and thicker. Green beans need to be cooked in boiling water. Green beans are immature beans in an edible pod. Bean pods, as they mature get woody, and even if the beans are young like green beans usually are, they still have that woody substance in them called “lignin”. Microwaving just doesn’t seem to really soften them properly, nor does steaming. (Note: it is fine to just nuke frozen string beans in a bit of water, as they were blanched before freezing.) They need about 10 minutes in boiling water to develop the texture and flavour. Mind you, the liquid doesn’t have to be water. You can braise them in say, stewed tomatoes, with some onions and peppers, the way the Italians do, and the beans seem to absorb all the flavour in the sauce; you would braise them for at least 45 minutes until the sauce reduces and thickens. Pressure cooking is also fine: 2 to 3 minutes on high, or 5 to 7 minutes on low. When boiling beans in water, some of their vitamins do leech into the cooking water. You can freeze that water for use later in soups, stews, sauces, etc, so that in effect no vitamins or taste is lost in your kitchen. Before using fresh green beans, wash, top and tail them. It should be no longer necessary to “string” them, but if you can detect strings, pull them off after you have topped and tailed the beans. 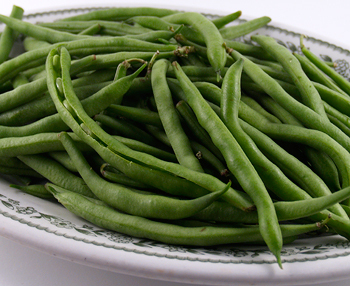 When green beans are sliced length-wise into thin strips, this is known as French or julienne-style. If you cut your beans this way, boil them for a few minutes less. To blanch green beans, put them into a pot with already-boiling water, and leave them in there for about 2 minutes. They will turn bright green. 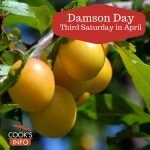 Drain them and put them into a pan or bowl of very cold water to stop the cooking process immediately. Yellow Beans; Runner Beans; other types of podded beans such as fresh Romano. Good source of potassium and vitamin A. Store in the refrigerator for up to 5 days tightly wrapped in a plastic bag. Freezing: Wash the beans, top and tail them. Cut them up, and blanch in boiling water for 3 minutes (no more!) whether whole, sliced or chopped. (Start counting the blanching time from when the water returns to a full boil after adding the beans.) Plunge into very cold water to cool them, then drain well, pack and freeze for up to 6 months. Green beans are native to South America. When they were brought back by explorers and botanists began promoting them, they were accepted quite easily by Europeans because they were similar to something they already had — broad beans. Until a century ago, these beans had tough strings along the side that you had to pull or “snap” off before cooking — hence the older names of “String Beans” and “Snap Beans”. Today, most of the ones you’ll find in stores are almost all stringless. They’ve been bred that way, and the bean industry now wants us to call them “Green Beans” to move away from the connotations of the older names. Julia Child lifted a green bean from its boiling water and tasted judiciously. “Still crunchily underdone,” she sniffed, tossing it back into the pot. “Some old biddy once said if you boil beans quickly this way, they’ll lose some of their vitamins. I say, if you’re worried about that, eat more beans.” — Patterson, Suzy. Vacation doesn’t mean getting away from food. Charleston, West Virginia: Sunday Gazette-Mail. Sunday, 3 September 1978. Page 83. In England, these are called “French Beans”.